There’s something contradictory about a generic instruction manual espousing ‘celebrat[ing]…your day your way’. Nevertheless, props must be given to a DIY wedding how-to that was published ahead of its time in 2007, before the global financial meltdown turned thrifster DIY into hipster cool*. Props must also be given to the author, Kelly Bare, and her publisher, Chronicle Books, for creating a wedding book that has yet to date. This is achieved in part by a lack of photos (though the website references and pink, blue and cream colour scheme will eventually need a refresh) and a back-to-basics approach. Like most wedding books, The DIY Wedding is organised according to the planning process (i.e. budget and guest-list are tackled first) and sectioned into vendor categories (i.e. attire, invitations, photos and video, food and drink). Each chapter is a mix of tutorials, general advice, and real wedding anecdotes. The tutorials are more relevant than most. Instead of indulging in peripheral projects like rose-petal cones and ring pillows, The DIY Wedding focuses on essentials, such as bonbonniere and bouquets, or cost-cutters, such as shoe embellishments. The tutorials create fairly ‘basic models’, which one can ‘decorate away’ with personal touches. They’re often too basic, and require cross-referencing from other resources, but they do make a good starting point. The advice, which ranges from setting budget priorities to choosing a dress/seamstress to asking favours from friends and family, is also rudimentary. When discussing venue options, Bare does not consider all questions and or issues that need to be addressed such as access to toilets, hidden costs, alcohol/smoking/noise restrictions, etc. Don’t expect a comprehensive guide. Do, however, mine the book for new ways to DIY and save money. For instance, Bare touches on hiring students for photography and ceremony music and using fruit to double up as decorations and dessert. Her book works best as a verbal Pinterest, with the chapters acting as Boards. Half-page anecdotes inject much-needed personality. By limiting the details to such, the book avoids influencing couples in regards to taste. It’s a very different approach to other how-tos which often dictate the latest must-have/must-not-have wedding trends. Apart from the occasional ‘Green is the New White’ spiel, The DIY Wedding is non-judgemental, giving couples enough space to find their own ‘way’. 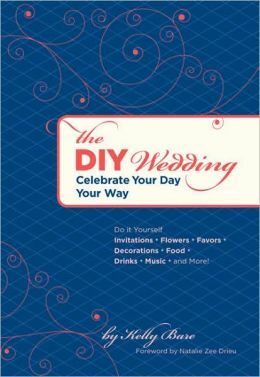 Like a good careers counsellor, Kelly Bare’s The DIY Wedding: Celebrate Your Day Your Way shows readers the how but not the what, when, where and why. It’s DIY without the buntings and mason jars that seem to be synonymous with today’s crafty weddings. It’s pretty basic, but it’s as good a place to start as any. According to Bride Box, ‘80% of couples plan to DIY some or a few parts of their wedding’. (via The Numbers Behind the DIY Wedding).